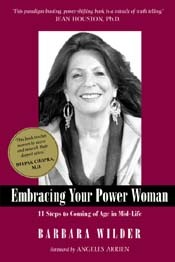 "In Barbara Wilder's EMBRACING YOUR POWER WOMAN, women can learn how to access and nourish their deepest selves. The Power Woman awakens the dynamism inherent in the feminine energies." 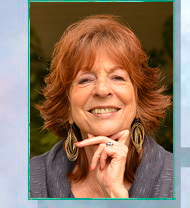 "This paradigm busting, power shifting book is a miracle of truth, telling. It guides the woman in her second half of life past pathos into new possibilities. She becomes a proactive participant in creating a life that engages her innate intelligence, skill, compassion and experience. With thunderous grace, world saving solidarity, the power women rise to make a difference, and bring autumnal wisdom to a time that brooks no whiny nay-saying. Ms. Wilder is well named for here, in this remarkable work she explores the wilder shores of women's genius, women's true and necessary power." Embracing Your Power Woman is more than a book, it is a step-by-step guide and a thrilling adventure for women in the second half of life to explore, express, discover, and embrace their developing Power Women. Essays, anecdotes, mythology, spirituality, and weekly exercises guide the reader through The Eleven Points of Power that take her into the depths of her psyche to review her fears, meet with her adolescent self, rescue the seed of her original feminine power, discover her purpose, and return to the world with a new sense of personal direction and freedom to become an enlightened leader in her community, her country, and her world. "Embracing Your Power Woman: 11 Steps to Coming of Age in Mid-Life is a dynamic, positive, and uplifting book for women who are seeking direction and courage in their quest to create an exciting and fulfilling second half of life." Embracing Your Power Woman is a course and it is an adventure. You can read it and follow the exercises and lessons on your own or you can do it with a friend, or with a group of women. Taking the journey with a circle of women is exhilarating, because, when women tell their stories, all the women in the circle benefit -- a group energy is created that enlivens and deepens the experience. As we move into the second half of our lives we begin to realize that women are meant to be sisters, not competitors, when we recognize this we begin the process of healing old wounds and entering into loving friendships with other women. You can form a group in your community to follow the journey to Embracing Your Power Woman, or you can create a group on the Internet. "Embracing Your Power Woman is more than a book. It is a "course in power" for women whose voices and opinions have long been unheard by our culture...the weekly lessons are an illuminating guide for bringing out the strength and potency of our wisdom years." © 2016 Barbara Wilder. Photos by Jack Greene. Site maintained by Boulder web designer Robert Piller.